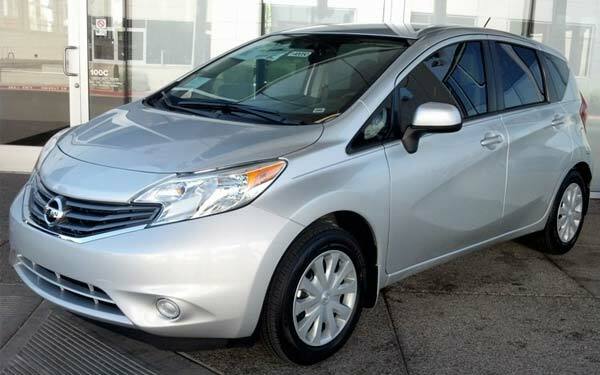 NEW NISSAN VERSA NOTE 2014. 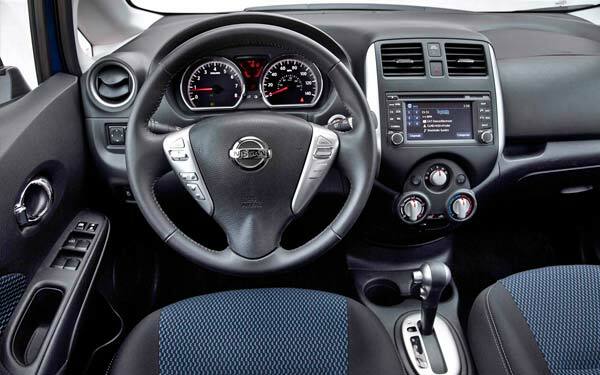 Considered in the automotive industry as one of the most attractive Nissan subcompact of recent times. DRIVER AND PASSENGER SEATS VIEW. With this economic model, Nissan pushes to other participants of the segment to strive to develop and equip their vehicles with more and better technology. The Note is the third model based on the V platform and is manufactured in the Nissan plant of Aguascalientes, Mexico. As far as design is concerned, the Note is undoubtedly an attractive vehicle that literally reached production without drastic changes with respect to the concept car Invitation, on which it is based. The Nissan Note is a subcompact minivan-like such as the Honda Fit, and therefore different from the traditional hatchbacks as Suzuki Swift or Ford Fiesta. Is worth highlighting that the interior space offered in the rear seats is far superior. Additionally, the Note, from its most affordable models, offers some unusual elements in the segment as the rear view camera, touchscreen and key-less ignition system. Under the hood you'll find the well-known 1.6-liter engine that delivers 109-hp and 107 lb-ft of torque which is coupled for first time to a continuously variable transmission Xtronic CVT. FRONT VIEW. The second generation of the Nissan's hatchback that competes in the economic segment, went on sale in the U.S. in the summer of 2013 and was introduced during the North American International Auto Show on Detroit. In terms of safety, includes front airbags, ABS brakes with EBD electronic distribution and ISOFIX anchoring system for baby seats. While it is true that from the basic version the Note offers safety equipment, it is also true that opts for the indispensable minimum, so it is in this area where Nissan has a large field of opportunity. INTERIOR DRIVER VIEW. 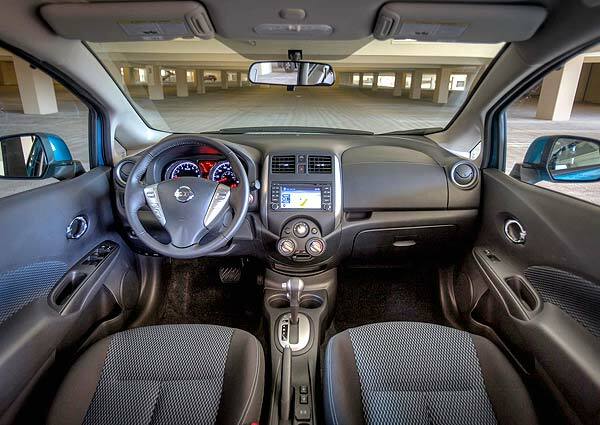 The big news in the new Nissan Versa Note is the parking assist system Around View Monitor. This modern electronic-visual system was offered only in the segment of luxury vehicles. On the other hand we think that the Nissan Note should offer side and curtain airbags as well as Electronic Stability Program ESP. Lastly, it comes equipped with power assistance steering, the front suspension is McPherson and semi rigid axle in the rear. This is one of the outstanding characteristics, and which most value gives to the Nissan Note. 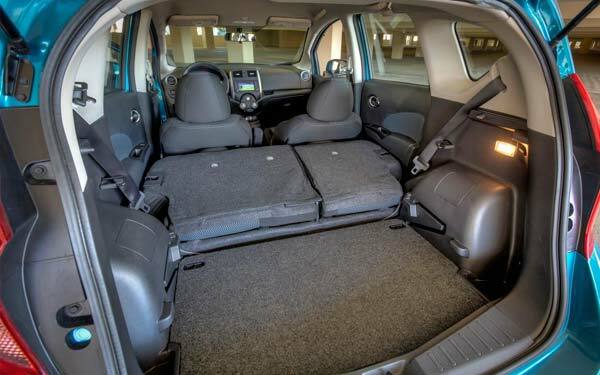 In addition to providing excellent space for both front and rear seats, the amount of convenience equipment that this vehicle offers is great. REAR VIEW. This little front wheel drive inexpensive car is able to reach 60 mph in 9.8 seconds and can reach a top speed of 115 MPH. Although assembly quality is good, the materials used feel a little cheap. They are hard to the touch, especially the climate module, which conveys a very economical car sensation when you use it. Behind the wheel, the Nissan Note is manifested as a vehicle focused on comfort, for example, the suspension tuning is soft and filtering of external noise is pretty good. The driving position is relatively high and thanks to the large glass area it offers a wide visibility. INTERIOR VIEW FROM REAR DOOR. The second generation of the Nissan's hatchback that competes in the economic segment, went on sale in the U.S. in the summer of 2013 and was introduced during the North American International Auto Show on Detroit. The CVT transmission, while it is true, is a good ally to get good fuel economy in the city, is not so much when it comes to pass another car or get into the highway. Like many other transmissions of this type that I have ever tried, when they are coupled to four-cylinder engines, the response can be described as slow. 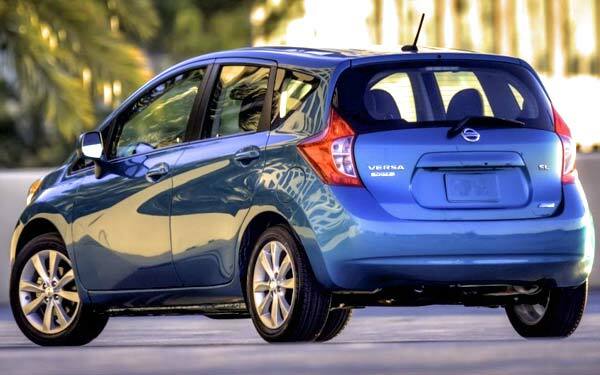 However it is necessary to clarify that the focus of Nissan with the Versa Note is not the sportiness but to stand out in other aspects such as comfort, practicality and efficiency. Besides being the second cheapest car in the Nissan line after the Nissan Versa sedan which costs less than $12000 dollars, the Note is by far, the most attractive subcompact vehicle that they offer from the design standpoint. AERIAL VIEW. 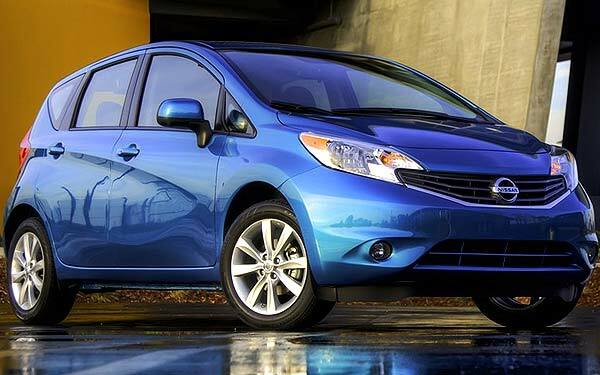 Nissan Versa is called "Tiida" in other countries. 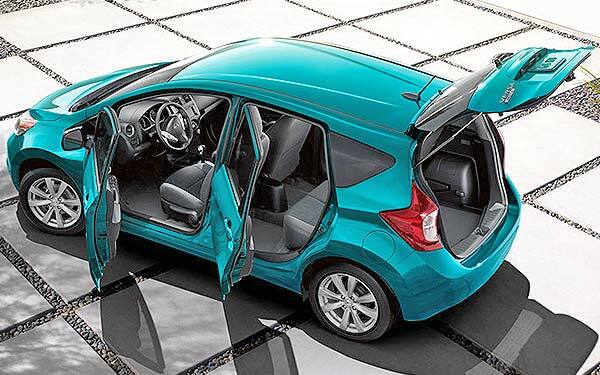 In addition to its very inclined windshield and deeply carved doors, the Versa Note has a dramatic character line called the "line of squash". If to this we add the already proven power-train of the Versa with the addition of a much more sophisticated CVT gearbox, the proposal seems much more interesting. It is important to understand that performance is far from being exciting, a characteristic that other Nissan models with the TSI mechanics can offer. However, the Note surpasses them smoothly in terms of interior space. In addition, it offers some other amenities like backup camera, browser or the key-less ignition system, features that are not available on its competitors, or if they offer this gadgets, they have a significantly higher cost besides of being optional. REAR SEATS VIEW & SPACE. Its spacious interior offers better volume with 115.5 cubic feet of cargo space and best-in-class of 21.4 cubic feet. 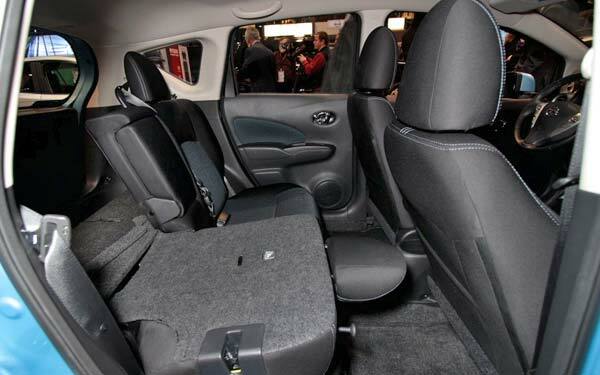 An increase of 17.8 cubic feet with respect to the previous generation of the the Versa hatchback. Although the materials used in the interior could be of better quality, the reality is that having a well cared assembly, it becomes an issue that can be ignored. However, the only pending issue of the Note is on the safety area, where while it is true, offers enough, some competitors offer many more features. The Versa Note 2014 is offered in 3 different versions. The S, S Plus and SV, being the S the most basic and cheapest model which you can buy or own today for under $14000 dollars. This S model has a decent fuel efficiency of 27 MPG within the city and 36 MPG on highways, while the most expensive one which is the SV, has 3 different sub-models, SV base, SV with SL Package and SV with SL Tech Package, which starts at $18,490. The S Plus and SV models have the same fuel efficiency: 31 MPG within the city and 40 MPG on highways.